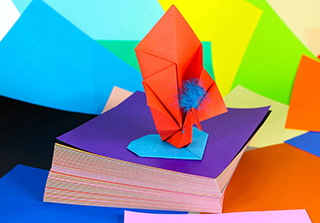 Go ahead, fold and transform these Origami Papers! Artisans and amateurs alike will find the perfect origami papers in our collection. 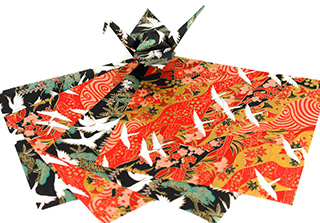 Imported from Japan, Nepal, and Thailand, our origami papers provide an enchanting origami experience. Select luxurious and durable Nepalese Lokta Papers for natural hues and highlights. Or choose lightweight Thai Unryu (Kozo) paper for projects requiring a soft feel and fine details. For those into Le Crimp, Hand-Marbled Momi Papers provide uneven and heavy textures without the need to crumple the paper. We even carry Japanese Chiyogami Origami Paper providing intricate, hand-silk screened prints for ornate projects and paper doll folding. The difference between these origami papers and others on the market lie in the fibers. Lokta, Kozo, and Momi papers contain long, plant fibers instead of wood pulp. The longer fibers provide greater strength, less tearing and less feathering than papers made from wood pulp. The fibers provide depth and textures that are not found in copy paper or other machine made papers. 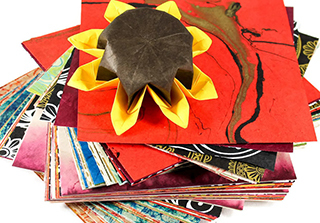 However, if you enjoy traditional solid colors and prints in a rainbow of colors, we also carry a large variety of Japanese Origami Paper Kits. 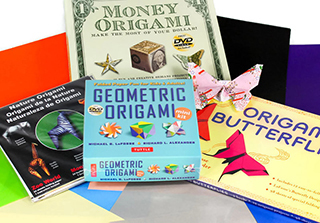 Many of these kits contain basic origami patterns and instructions. Browse our selection and choose the paper that is right for you.